One of the great things about leasing a brand new car is the sense of newness that extends across every aspect of the car, from that perfect new-car smell, to the glorious untouched gleam of brand-new tyre tread. Tyres generally suffer wear and tear rather quickly. It is easy to forget about them and believe they’ll last forever, but the tyre tread depth shortens little by little with every mile, and it isn’t too long before you have to start wondering about the legal tyre depth and questioning whether you will soon be receiving a driving-with-illegal-tyres fine. Outside of the most extensive car leasing maintenance contracts, it is your responsibility to keep your tyres in good condition - to regularly check tread depth and tyre pressure. It isn’t too complicated to maintain car tyres yourself - with this simple guide, you can learn how to regularly check tyres and keep your car in the driving condition it was in when you first took it home. It is really important that you keep your tyre tread well within the legal limit for tyres. 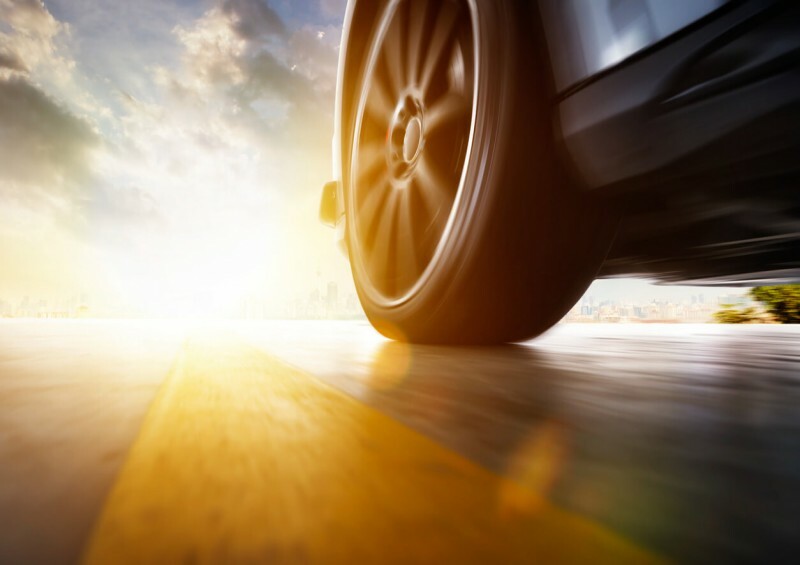 Failure to do so can result in a fine of up to £2,500 as well as three points on your licence - but more worryingly, it can lead to a loss of tyre grip and become the catalyst for a significant accident. Unsure how to check the tyre tread? Use a 20p coin! The legal minimum depth of tread for car tyres is 1.6mm, which just so happens to be fairly close to the depth of the raised edging on a 20 pence piece. If you place the coin in the car tread and cannot see that outer edging, then your tread is within legal limits – but if it pokes out then you need to replace the tyre. Simple, but effective – just remember to check the entire tyre. Look for the minimum tyre tread indicators on the tyres – you may never have noticed these smaller bumps of rubber in the tyre grooves, but they are there to help you maintain a legal tread depth. If the small bump is flat to the main tyre tread, then your tyre has had its day – a legal tyre tread will be higher than these little indicators. Visit a garage – most garages, and certainly anywhere that sells tyres, will have someone willing to quickly give your tyres a once over and let you know if you are close to the legal limit. Pop in when you have a spare five minutes (but if you do need new tyres, expect to be convinced to change them on the spot!). You regularly visit a petrol station – take the time while you are there to regularly check your tyre pressures. Your car manual will tell you what PSI (pounds per square inch) you should be setting each tyre to, and if not, then a quick search on your phone will let you know the correct value. Unsure how to check tyre pressures? Simply use the air machines available at almost every petrol station to read the current value and inflate as required. It may cost you 20p or so, but it’s a small price to pay for the safety and extra life you can get when you look after your tyres. If you want to be able to check at home, all small foot pumps will have a gauge to tell you the current pressure and they are a valuable piece of car kit to keep with you in case of a problem on the road. If you can, try to check the tyre pressure when the wheels are cold (i.e not in the middle of a long drive) as heat can affect the pressure and sometimes lead to slightly incorrect readings. Over and under-inflated tyres can lead to increased wear, blowouts and poor fuel consumption, so it really does pay to check regularly. Tracking, or wheel-alignment, along with the correct wheel-balancing goes a long way to extend the life of a tyre. When the wheel alignment isn’t optimum, the wear on the tyre can become focused on a single section of the tyre rather than the correct spread as designed, and you will cut hundreds of miles off the life of your tyre. If you notice the tracking is off (easily tested by loosening your grip on the steering wheel on a straight road and seeing if the car veers in either direction), then go to a garage and ask them to align the wheels. The small cost of this minor piece of maintenance is an investment in the life of your tyres. Many people in the UK answer the question of ‘Do I need winter tyres?’ with an ill-conceived ‘no’, but the truth is that we now have the type of cold winters and long periods of ice and snow which are exactly the type of conditions that winter tyres are designed for. Once the temperature drops below 7oC, winter tyres become a valuable alteration to your car. With a different tread layout, slightly harder material, and deeper tread, winter tyres are far better suited to cope with the cold weather and potential slipperiness of the road surface – they are also usually cheaper than their summer counterparts. By switching to winter tyres for the coldest months of the year, you not only improve your safety in treacherous conditions, but you give a nice break for your summer tyres and increase their longevity. The only real problem is where to store the unused set of tyres but if you have a garage or space in a garden shed, then it shouldn’t pose a problem – just don’t keep them in the boot of the car as the added weight can add to the wear of your new winter tyres! How do you keep tyres in good condition? Don't drive like a rally driver. Some of the main problems that can significantly lower the life of your tyres come from poor driving. Things like carelessly driving through potholes or scraping the side of the tyre on the kerb while parking can shave months off the life of your tyres. Frequent braking can also have a major impact – examine how you approach junctions and corners, as it could pay you dividends in the long run. A good set of tyres should last 30,000 miles or so – enough for two years of driving for the average driver. If you find yourself having to change tyres a lot more frequently, then it’s worth looking at your driving habits (as well as checking out mechanical issues like the wheel alignment). Tyres frequently wearing out due to poor driving often goes hand in hand with high fuel consumption. By taking more care and attention with your driving, you will find there are savings to be made with both fuel and tyres together. Sometimes the expense of replacing a full set of tyres is simply too much – or only a couple of tyres on the car are worn. If you want to put new tyres on in pairs, then it is best to pay attention to the rear wheels. There can be a lot of mixed information regarding the question ‘should I put new tyres on the front or back?’ – with people debating front-wheel drive vs. rear-wheel drive and other factors, but according to the AA, the answer is simple: put the new tyres on the back. The reason for this is that having the better tyres on the back in poor road conditions means the car leans towards understeering rather than oversteering. In simple terms, understeer is when slight adjustments to the steering wheel make little impact in the direction of the car, meaning you have to put a little more into your steering than normal, where oversteer indicates the back of the car being less controllable and can lead to the car spinning in the worst of conditions. While neither is desired, understeer is generally a lot safer than oversteer. It is also true that the tyres with the better tread (i.e. the newer ones) are more resilient to objects that might cause a puncture, and controlling a car that has suddenly blown a back wheel out is a lot harder than dealing with a puncture in the front wheels – another factor that lends weight to putting the better tyres at the back. Damage to the wheel trim (from a bump up the kerb, for example), can lead to issues such as a slow leak and lowering of tyre pressure. Sometimes other issues come up too, like a rubbing somewhere which wears away the inner edge of the tyre. It’s not quite enough to just check the tread and pressure when looking at the tyres. Some unexpected issues can cause damage where you wouldn’t expect. Tyres have been damaged from such oddities as a stick caught under the mudguard rubbing on the tyre, or regular parking on a heated air vent affecting the pressure on one single tyre – if you notice an unusual problem with your tyres, it’s worth thinking outside the box when it comes to the solution! If you are in any doubt, take the car to a garage and ask them to fully test your wheels. It may cost you a little but having impeccable tyres can literally be life-saving if an accident occurs, and no price can be put on that. When you choose what car you want to lease and it is first delivered to you, it will have the manufacturer’s recommended tyres on it. While there’s no requirement that you replace them, there are plenty of reasons for choosing superior tyres, including safety and longevity. Try to avoid ‘budget’ tyres – often, these poorer quality replacements do not work out cheaper than the better-known alternatives and can require a replacement sooner than their cost merits. Like most things, a quick look on the internet will result in reviews of tyres and it can be worth spending a few minutes researching before making your choice. If you are interested in leasing a brand new car with its glorious new tyres, or if you just want advice on leasing or your car purchasing options, give us a call today and we'll be more than happy to help - whether that's finding you the best lease deal in the UK, or simply answering your questions and giving you advice.